Over the weekend in downtown Seattle, you may have seen cosplayers dressed as Black Widow by the International Fountain, or you might have noticed your social media feeds were flooded with pictures of Black Widow. You might have seen that the hashtag #WeWantWidow was trending. That’s because there was a multi-city flash mob to generate buzz and awareness of the lack of Black Widow on Avengers merchandising, as well as to show support for Black Widow to star in her own movie. Starting in Sydney, Australia at 12:00 pm local time, the “Widow Wave” spread across to Canada and the United States. 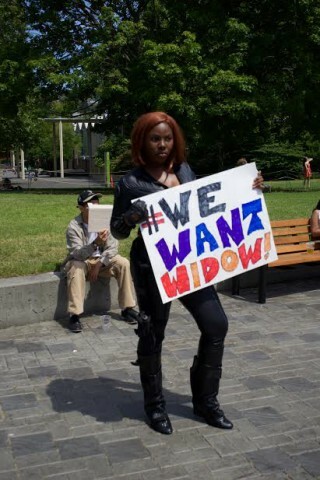 In cities from Tampa to Ottawa, and from New York City to San Diego, hundreds of cosplayers dressed as Black Widow descended on the streets, while even more online supporters showed their support by changing their profile images to ones of Black Widow, and reposting images or tweeting using the hashtag #WeWantWidow. 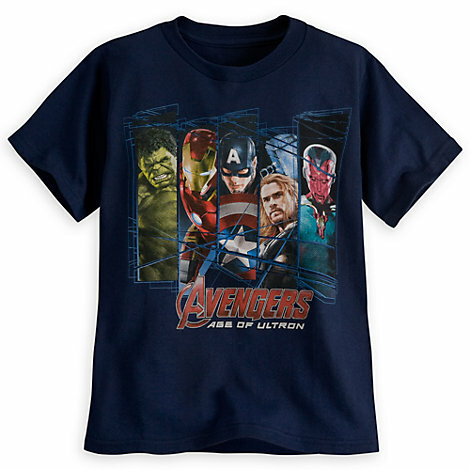 Marvel Avengers tee for boys. Image source: Disney Store. 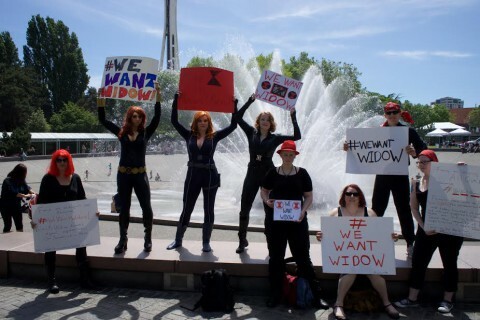 Members of the Black Widow flash mob in Seattle. Courtesy: Jennifer K. Stuller. The promotional merchandise for Avengers: Age of Ultron shows Black Widow a total of three times, while Scarlet Witch—the only other female heroine—appears a whopping zero times. In fact, Black Widow’s absence is so noticeable that there are whole tumblrs devoted to this issue. This was evident from surprised onlookers who quickly took up the cause themselves, sharing photos of the Widows and adding the #WeWantWidow hashtag. It ended up trending on Twitter. Jen says that #WeWantWidow gives fans “a positive way to celebrate both the character and our love of female super and action heroes.” It hopefully also demonstrated that there is untapped market potential in making superhero merchandise more inclusive, as there’s a larger demographic for filmmakers and merchandise producers than they originally thought. It also sends a message about the power of individuals to stand up for what they believe in—after all, Kristin started #WeWantWidow by simply sharing an idea with others online. “I hope this inspires more geek girls to stand up and continue to have a strong and positive voice for inclusion in our community,” she says. This article was originally written for GeekGirlCon.